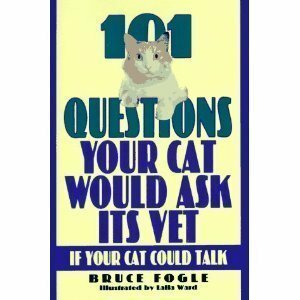 Amazon.com description: Product Description: Contains sensible and practical advice from the author who assumes the role of "agony uncle" to questions "asked" by his cat patients. from Castle (April 1, 1995); titled "101 Questions Your Cat Would Ask Its Vet If Your Cat Could Talk"
from Diane Pub Co (March 1, 1993); titled "101 Questions Your Cat Would Ask Its Vet If Your Cat Could Talk"
About: Contains sensible and practical advice from the author who assumes the role of "agony uncle" to questions "asked" by his cat patients. from Carroll & Graf Pub (May 1, 1993); titled "101 Questions Your Cat Would Ask Its Vet If Your Cat Could Talk: If Your Cat Could Talk"